Join us Friday Nights for Rock-n-Bowl!! 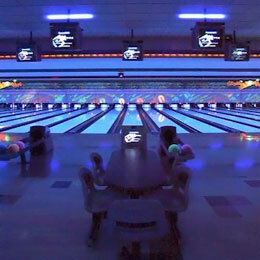 Hudsonville Lanes’s Cosmic Bowling is your Cosmic Bowling experience in Hudsonville. Laser Lights, Disco Lights, Black Lights, and Runway Lights. LOUD heart pounding music. Our Cosmic Bowling lanes even glow in the dark during our Cosmic Bowling Events! Cosmic Bowling is the hottest bowling experience in Hudsonville. Black lights, spot lights, strobe lights and fog teamed up with loud heart pumping music videos makes this the most bowling fun around. Our lanes even glow in the dark during Cosmic Bowling. We also offer great Cosmic Bowling parties for kids, teens, and adults, call us or check out our parties page to start planning your event! Every Friday night from 9:00pm - 11:00pm! Shoe rental included. Available October through April.